Cheap Mama Chick: Up to 45% off Kidkraft Dollhouses and Play Kitchens + Free Shipping! 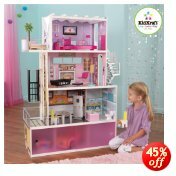 Up to 45% off Kidkraft Dollhouses and Play Kitchens + Free Shipping! Super Kidkraft play kitchen and dollhouse deals from Amazon! Check out these discounts! All items will ship free at $25 or with Prime! Find all of these and more Kidkraft deals from Amazon here!